The thyroid gland is located in the lower part of the neck, below the Adam’s apple, just above where the collar bones join the breastbone. The thyroid gland has two lobes on either side of the windpipe, which is joined by an island of tissue called the isthmus. 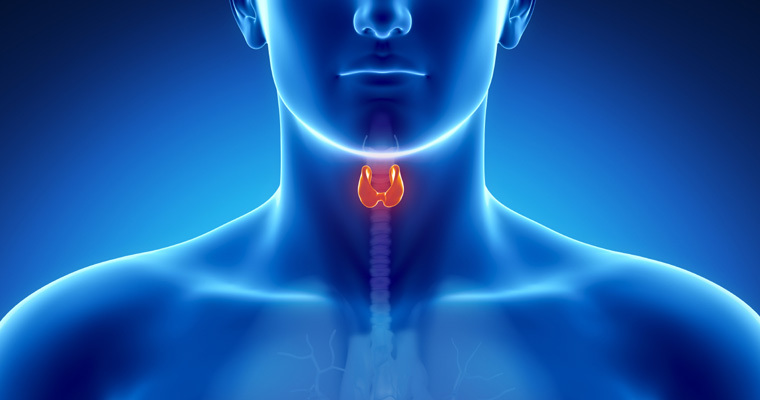 The thyroid gland makes hormones that control the body’s overall energy by regulating its metabolism. Too much thyroid hormone will make you lose weight, feel hot, shaky and nervous, and cause your heart to have extra beats or palpitations. Too little thyroid hormone can make you feel cold, sluggish or confused, and will cause you to gain weight. What is the parathyroid gland and what does it do? The parathyroid glands are four tiny glands located beside the thyroid gland in the neck. Their function is distinct from the thyroid gland. The parathyroid glands secrete parathyroid hormone (PTH). The job of the parathyroid glands is to regulate the balance of calcium and phosphorus in the body. Sufficient amounts of calcium are needed for strong bones, healthy teeth, nerve transmission, muscle contraction (including of the heart). Phosphorus is required in combination with calcium for building bones and teeth. (However, excess phosphorus interferes with retention of calcium. Accordingly, too much phosphorus is harmful. Likewise, too much calcium “hypercalcemia” is not beneficial either.) The PTH secreted by the parathyroid glands maintains the correct amounts of calcium and phosphorus in the body by releasing calcium from the bone, increasing absorption of calcium from the small intestine, controlling the amount of calcium excreted by the kidney, increasing excretion of phosphorus in the urine to lower of phosphorus in the blood. When disease affect the thyroid, its size or activity bay become abnormal. These diseases include thyroid cancer, goiter, and hyperthyroidism. In some cases, the thyroid needs to be removed by surgery. The extent of thyroid removal depends on the patient’s condition. • Partial thyroidectomy – the removal of an entire lobe and maybe part of the isthmus. • Total thyroidectomy – the removal of the entire thyroid gland. Parathyroidectomy is surgery to remove parathyroid glands tumors. It is performed while the patient is under anesthesia (unconscious and pain-free). An incision is made in the neck just under the Adam’s apple. The four parathyroid glands are located. • Partial parathyroidectomy – three of the glands are removed, leaving one to help prevent hypoparathyroidism (low level of parathyroid hormone). • Total parathyroidectomy – all four glands are removed. The incision is then closed. With this procedure, some of the parathyroid gland tissue is usually re-implanted in the forearm or neck muscles so that some parathyroid hormone will still be produced in the body and hypoparathyroidism can be avoided. A History and Physical Examination: It is important to know your full health history and any and all of the medicines you take. We even need to know if you are taking vitamins and/or herbal medicines. Have your primary care physician perform a preoperative physical examination on you. Blood Work and Tests: According to your age, medical condition, and the type of surgery planned, you may be asked to have an EKG (heart tracing), chest x-ray, or blood work before your surgery. Dr. Ruder will explain the surgery and you will be asked to sign Consent to Surgery form. What do I do with medicines? You must not take any pills that will affect bleeding. Stop these of medicines TEN DAYS before surgery (i.e. Aspirin, Motrin, Alka Seltzer, Advil, Anti-inflammatory medicines). Ask your doctor if you have any questions regarding what medicines you take that may affect bleeding during surgery. Any other medicines should be taken up until the day of surgery, as by the doctor. Do not drink or eat ANYTHING AFTER MIDNIGHT before your surgery. If you are diabetic, your anesthesiologist will give you medicines (insulin etc.) in the hospital. What happens of the day of surgery? You will report to the admitting office. Then you will be taken to a preoperative nursing unit where you will charge into a gown. DO NOT BRING MONEY OR JEWELRY. A nurse will review your chart and confirm that all paperwork is in order. You will be taken to the preoperative nursing unit, where an anesthesiologist will start IV (intravenous line). You will then be taken to the operating room by your anesthesiologist and nurse for surgery. What happen during the surgery, how it is the surgery performed? Thyroid surgery requires an incision 3 to 4 inches long, placed just above the collar bones joins the breastbone. Rarely is a larger incision required. We make every effort to keep the incision line as small and inconspicuous as possible. In removing the thyroid gland, no muscles in your neck will be removed. The muscles will be stretched or retracted to the sides to allow us to see and remove the thyroid gland. During the procedure, we will take great care to identify, the nerves of the voice box or vocal cords that are found just behind the thyroid gland. Additionally, we search and preserve the four small glands called the parathyroid glands, which lie next to the thyroid gland. These four very small glands produce a hormone called parathormone. This hormone controls calcium levels in the blood. Portions of these glands are sometimes removed. The smallest operation that can be done on the thyroid gland requires removal of half of the thyroid tissue in your neck. This is called a thyroid lobectomy. If we do not have a preoperative diagnosis of cancer from the needle biopsy that was done before surgery, the portion of the thyroid that is removed, will be sent to the pathology laboratory for immediate examination under a microscopy, to determine if cancer is present. This analysis is called, “Frozen Section.” Some or all of the nodes in the neck may also be removed, depending upon the type of thyroid cancer found at the time of surgery. A drain is placed in the operated site before the incision is closed. The operation takes about two or three hours with at least another 1-2 hours in the recovery room afterwards. You will awaken in the Post Anesthesia Care Unit (PACU). The nurses will give you medication needed to keep you comfortable and pain free. However, you will have a sore throat when swallowing from the anesthesia tube that was used during your surgery. The sore throat and soreness when swallowing may last for 3-7 days. This is normal. Your family will be able to visit with you approximately four hours AFTER surgery. I shall meet with you family after the surgery is completed to discuss your findings. If they are to leave the hospital, please give me a telephone number to contact them after your surgery. There will be a small drain, less than ¼ of an inch wide that will exit from the incision in your neck. This drain is designed to prevent any fluid from building up in the area of the surgery. The drain will be removed prior to your discharge from the hospital. •You will have a call light handy – let the nurse know if you need something! •It is normal to feel tired, groggy, and weak from the effects of anesthesia. Do not get out of bed by yourself! Ask for help. •You will be asked to remain in a sitting position in bed. You will be able to move your head as you wish. •You may also feel nauseated and have some soreness and stiffness in your neck form the operation. Medications will be available if you need them to relieve discomfort. You must let the nurse know when you begin to feel uncomfortable. • Some patients will have a sore throat and/or hoarseness from the tube used for your anesthetic. Ice chips or throat spray may help you throat feel better. After you have awakened from the effects of anesthesia, you may begin drinking LIQUIDS, and then gradually resume a regular diet in the hospital. Blood tests may be necessary to check the level of calcium. The level of calcium in you blood is controlled by the parathyroid glands. Even though these glands are not removed, they may go into shock for a short period of time and the levels of calcium may drop. Symptoms of low blood calcium include numbness of your hands or lips, muscle cramps, or facial twitching. If you or your families notice these symptoms, be sure to notify your nurse. This situation is not uncommon and when it occurs, it is short-lived lasting from 1 to 21 days. If low blood calcium levels are confirmed by blood tests, you will be given oral supplements until the shock to the parathyroid glands passes and your blood levels of calcium return to normal. If you go home on oral calcium supplements, and the symptoms of low blood calcium level occur again, call Dr. Ruder’s office and/or your endocrinologist. A visiting nurse will take blood levels of calcium on a daily basis until we feel your calcium levels have stabilized. •The fluid from the drain tube has decreased to an acceptable amount. •We are sure that your blood levels of calcium are normal. This can occur as soon as the day after surgery or may take up to 5 days. In all cases, you will only be sent home when it is safe to do so. You will stay in the hospital as long as it is medically necessary. What will I need to know to go home? A nurse will review discharge instructions with you and give you written information to take home. You will be given any additional medicines by your nurse for home use. You may shower as usual. The incision may be gently washed, not scrubbed, with mild soap and water. Pat the area dry. You should plan on having a family member or friend drive you home. You will be scheduled to visit our office within 5 to 7 days. By the time you are discharged, most patients receive adequate pain relief from Tylenol. However, if you need prescription-strength medicine to be comfortable, or medicines for sleep, you will have been given prescriptions for them during your preoperative visit. You will be educated on how to inspect your incision. Inspect the incision daily and report any redness or signs of infection to your physician. • Symptoms of hypoparathyroidism, which include tingling and spasm of the hands or face. How long does it take for my incision to heal? Will there be scars? Neck incisions heal rapidly. They are water tight in about 24-36 hours allowing you to shower carefully. The incision normally heals fully within four months. There is also swelling and a felling of firmness under the incision that may last for several months. Most scars are most noticeable 1-2 months after operation and gradually become less so after several months. At that time, you may notice the color is redder than surrounding skin. This is normal and will improve. However, this skin is sensitive to ultraviolet radiation so you should cover the incision with sunscreen (SPF 30) when outdoors for extended periods of time to prevent darkening (hyper-pigmentation) of the area. If you wish, you may use vitamin E cream or other moisturizers on the incision. Some patients have a genetic predisposition to heal poorly and develop large scars or keloids. Let the doctor know if you or any of your family members have a history of poor healing. You may have some difficulty swallowing for up to 6 weeks. You can eat any foods that have been in your diet before surgery. Most patients recover quickly from thyroid or parathyroid surgery. We encourage you to resume your normal routine as soon as possible, usually within a few days after returning home. Most patients are able to return to work in 14-21 days or sooner if desired. Remember, you are recovering from surgery and your resistance to “colds,” flu, etc. will be lower for almost one month postoperatively. You may drive whenever you feel comfortable after a few days. You should not drive if you are not yet comfortable turning your head or if you are taking narcotic pain medications. You are likely to have some stiffness in the front and back of your neck, which may take up to 6 weeks to completely resolve. You should not be afraid to move your head and neck. Gently flexing and stretching you neck muscles will prevent you from having a neck that feels stiff. As long as it is not very painful, try touching your chin to your chest and touch your chin to your shoulder. Increase your exercise and other activities with moderation. That means do a little more each day. If you have no problems the following day, you may increase your activities. What are the Risks of Thyroid of Parathyroid Surgery? • Heart and Circulation problems such as heart attack or blood clot formation. Clots which form in the legs can move to the lungs and cause life threatening problems. Blood clots or debris can similarly cause a stroke. This is why we want you to get up and walk as soon as you can postoperatively. • Wound infections are not common, but may be more likely in people with diabetes or steroid therapy. • Chest infections such as bronchitis or pneumonia can develop after a general anesthetic. This is why we want you to breathe deeply and try to cough to clear your lungs. • A keloid may form within the surgical scar. A keloid is an overgrowth of scar tissue which may be raised, tender, pink, and irregularly shaped. Should this occur, treatment is available to improve the appearance of the scar. Overall, there is little risk of complications from thyroid or parathyroid surgery. However, these operations can be very challenging due to the variable anatomy, small nerves, and other important structures in the region. Therefore, they are best performed by experienced Specialists Head and Neck surgeons. • Bleeding from a vessel divided at the time of surgery, may occur even early after the operation. This may cause difficulty breathing due to the pressure it creates under the incision. Transfusion is rarely necessary, but a second operation may be required after a blood collection is released through your incision. This is NOT common. • Hoarseness is common after surgery. In very few cases does it last more that a few days. Injury to the recurrent laryngeal nerve may occur during surgery, causing a more permanent hoarseness. These nerves control the vocal cords, and are very delicate. Of every 100 patients having thyroid surgery, less than 1 or 2 will have a permanent injury to this nerve. Patients with thyroid cancer, very large goiters, or a history of previous neck surgery are at more risk of nerve injury because of the increase difficulty of the surgery. If related to this nerve dysfunction, voice changes may often be improved with speech therapy or corrective surgery. Even if the nerve function is normal, up to 5-10% of people may feel that their voice is slightly different after the operation. If you are a singer or public speaker, you should discuss this further with Dr. Ruder. • Low calcium if your calcium level falls after the operation, you will be given calcium supplements, either by IV or by mouth. About 15 % of thyroidectomy and 25% or parathyroidectomy patients may require calcium supplements for a few weeks. You may even be prescribed calcium supplements upon you discharge to prevent symptoms from a temporarily low blood calcium level. Of every 100 patients having a total thyroidectomy, only 1 or 2 will need to continue taking calcium supplement beyond 6 months following surgery. Thyroid hormone if you have a total thyroidectomy, you will need to take thyroid hormone medication for the rest of your life. The amount you may need will be determined by blood tests. Once the levels are correct, blood tests once per year are routine in the event that your requirements may change. Remember that there are no bad questions – you are encouraged to call us whenever you have questions at: (310) 285-9612.